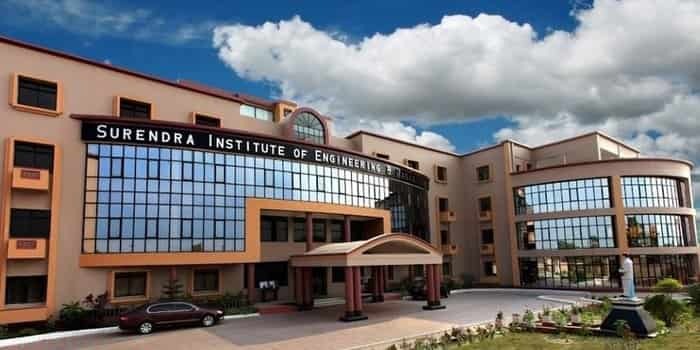 SIEM Siliguri 2019-20 Admission: Courses, Fees, Placement, Review etc. Surendra Institute of Engineering & Management is a Graduate Engineering and Management College established in the year 2009 in Siliguri, West Bengal, India, under the aegis of a charitable society Bidya Bharati Foundation. The institute was inaugurated by Mr. Asok Bhattacharya, the then Minister for MAUD, Govt. of West Bengal & Mr. Sourav Ganguly, former Captain, Indian Cricket Team. It is also approved by AICTE and affiliated to the Maulana Abul Kalam Azad University of Technology (MAKAUT), formerly known as WBUT. It is named in the memory of (Late) Mr. Surendra Agarwal. In this article, we will provide you with the detailed information about Surendra Institute of Engineering & Management Fees Structure, Course offered, Admission Procedure, Placement, Facilities available and complete college review. Surendra Institute of Engineering & Management. For Admission to Different UG Courses Candidate will have to clear the West Bengal Joint Entrance Examination (WBJEE). Admission in UG Courses is based on WBJEE Scorecard. Candidate will have to clear the Central Board of Secondary Education JEE Main Entrance Exam. Admission in UG Courses is based on JEE Main Scorecard. For Lateral Admission to Polytechnic Candidates will have to Clear the Joint Entrance Examination of Lateral Entry (JELET), Also Conducted by WBJEEB. Must have passed H.S. (10+2) examination of the Council of Higher Secondary Education, West Bengal or equivalent. Must have secured minimum 45% in PCM (40% for SC/ ST/ PH candidates). Minimum 30% marks in English and individual pass marks in PCM, English, and Vernacular is a must. Must have passed secondary (class 10) examination of the Council of Secondary Education, West Bengal or equivalent. Must have secured minimum 45% in Diploma (40% for SC/ ST/ PH candidates) or must have secured minimum 50% in B.Sc. Placement record of SIEM Siliguri is of average grade as the college is pretty new, but the Placement cell is continuously working day and night to bring some of the best recruiters to the college and hence the scenario is now changing. From past couple of year SIEM, Siliguri has witnessed some of the best companies like TCS (OFF-CAMPUS), ThoughtWorks, YODLEE, NEOSOFT TECHNOLOGIES, BLUEGAPE, PERSISTENT SYSTEMS, REALITY INFRA JUNCTION PVT LTD and much more into their campus which is making the college almost 90-100% of placement assistance. We would like to give out 4.1 of 5 stars on Edufever Best Engineering Colleges in West Bengal.